Quinoa (pronounced Kin-wa). It’s not a grain; it is related to spinach. Its ברכה is האדמה. Its seeds may or may not be ground in the same way as Potatoes maybe ground and everyone eats potatoes (despite the חיי אדם trying to make them אסור on פסח because of Kitniyos). There are, of course, others, who assert that the גזרה of Kitniyos on Pesach doesn’t apply in Israel, but we won’t go there in this article. Let’s just look at Kosher Australia. Recently, a letter was circulated by Kosher Australia, explaining the reasons for food items becoming non kosher “suddenly” together with an explanation denying a sudden lurch to “the right.” It was a well written letter and I am a supporter of Kosher Australia aligning their standards with the OU. The OU, in my opinion, is the premier and most trusted Kashrus Authority in the world. Okay, I’m biased because I ask (major) questions to Rav Schachter, who happens to be one of the two Poskim for the OU. On the matter of Quinoa on Pesach, Kosher Australia advised us that it was following the practice of the OU and that as a result Kitniyos were not to be used. Coincidentally, I had printed out the 2011 OU Pesach Guide and was reading it. I found that the assertion by Kosher Australia vis a vis Quinoa and Kitniyos was false! In earlier years, the OU had been negative, but this year they decided (quite correctly in my opinion) that the issue of whether to use Quinoa was a matter for individual kehilos. Let’s face some facts. Determining whether something is or isn’t Kitniyos is not the same as telling us whether treyf is used as an ingredient in foodstuff. Kitniyos is in many ways a more complex question and one that requires a Psak from one’s own Rabbi who I believe will consult with his own Posek Muvhak given the nature of the question. I think the OU got it right. If you want to use Quinoa you should ask your Rav unless you happen to also have a family Minhag of חדש אסור מן התורה. This was also the basis for Rav Moshe’s permissive ruling on peanuts, but of course it didn’t matter if it was Rav Moshe, the Machmirim on the right eventually squeezed out a universal issur on peanuts (and peanut oil). I can remember in the old days we had oils that eventually “became” kitniyos. And no, we never had those nuts in Poland! Kosher Australia has no business determining what is and what is not Kitniyos. In fact, they have done a good thing by listing a table of items which some consider Kitniyos. This is the way it should be with Quinoa as well. This episode is a very subtle way that Rabonim are attempting to create a Minhag in Australia by default, by “trying to be all things to all people”. Yes, we are Machmir on Pesach. But even Rabonim said not to be Machmir on Potatoes. I know, Potatoes are a European staple and this avant-garde Quinoa stuff is something Charedim can’t spell or say, let alone know how to integrate into an oily cholent. 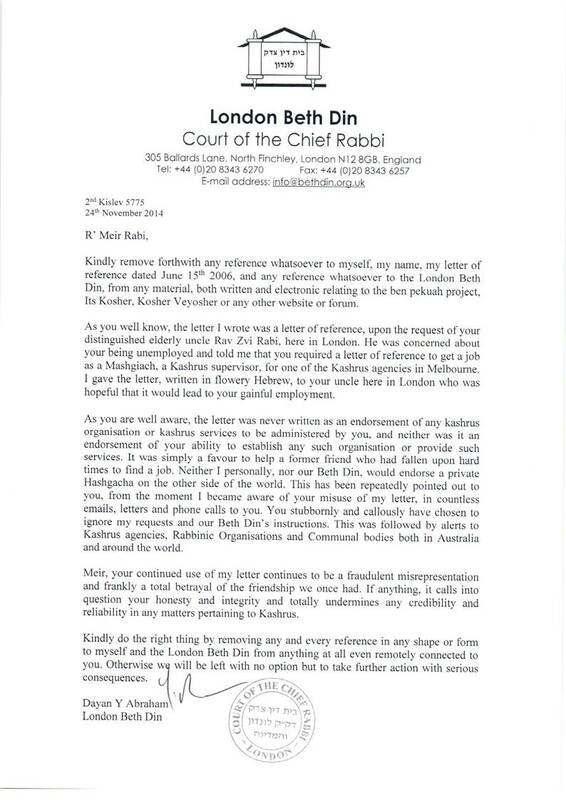 Yes, it is true that the London Beth Din don’t allow Quinoa, equally, the Star K and Chicago cRc do allow it. Kosher Australia should have adopted the stance of the OU and kept out of this. Rabbi Sprung in Melbourne paskened for Mizrachi that it was fine as long as it was supervised. By the way, the list of “maybe Kitniyos” listed in Kosher Australia’s booklet is also wrong. It claims that carrots are not Kitniyos according to all. That’s not true. I understand that Belzer don’t eat carrots. PS. My wife over-ruled me and she won’t let me use Quinoa unless it has a hechsher. I tried to tell her that Eden were certified as one of the brands that had no grain whatsoever in the fields or processing plants and, therefore, it was okay. She wouldn’t hear of it. “Where is the Kosher stamp?”. Ah, for Shalom Bayis …. Quinoa is grown primarily in Bolivia. The following plant products, amongst others, come from the New World – North and South America. POTATOES (not originally from Poland or Ireland), tomatoes, quinoa, passionfruit, and tobacco. What is the halachic position on smoking tobacco, marijuana and opium with regard to kitniot? Parenthetically, What is the halachic position on the validity of Torah works written under the influence of mind altering substances? ( I am led to understand that at least some famous works of Jewish mysticism were written under the influence of opium). Just to satisfy my curiosity as to the expertise of Rabbonim vis a vie the natural world, could you please identify a SINGLE scientific discovery or technological breakthrough in any published biblical or rabbinic work? Finally one of the themes that you discuss at length, the validity of someone’s opinion concerning Torah issues, has a major problem. There does not seem to be any reasonable ground rules to permit thinking. The Rambam got into trouble for being too bright and had his books burnt, Rabbi Adin Steinsalz also got into trouble for being too bright. Rav Kook got into trouble for thinking outside the Golus box. Do we just let the haredi taliban style intellectually and educationally impaired set the moral and intellectual compass in today’s world?? The 2010 Kosher Australia list has a note about Quinoa that despite being marked as Kittnoyot there are dissenting opinions. It also refers to the CRC and their concern about them being mixed with Chametz. Kashrut organisations have a fundamental problem: the idea of a supervisory business is extra-halachic. Halacha recognises eidim who can testify about factual matters and rabbonim who can rule on halachic matters, but it has no place for an entity that purports to occupy a middle ground. When Kashrut Australia says that Quinoa is kitniyot they are really paskenning for you. You object to them doing this – but in fact you accept their p’sak in thousands of other cases. I don’t like the present situation but I don’t see any real alternative. It would be impractical for them to state the facts of every case and let people ask their own rabbonim. So they say that we can no longer use olive oil without a hechsher despite the clear p’sak from earlier years – what are we to do? Perhaps the metzia has in fact changed. Perhaps it’s administratively convenient to follow the same practices as the OU. We don’t know, and we don’t ask, so in practice KA is our mara d’atra. Incidentally, we really need a preview button if we’re going to type these HTML tags by hand. I entirely agree that KA cannot create “minhag australia“. None the less, they’re acting as your rav and telling you not to eat it. You don’t want them as your rav? Fine – but then why do you accept their p’sak on thousands of other matters? Joe, they are actually acting as the Rav Hamachshir. They also have a community responsibility (although they should divest from Mizrachi and be under the control of the COSV, but I digress). In respect of Quinoa, they are NOT being machshir any foodstuff. There isn’t a brand of quinoa that they are even commenting about. Instead, what they have done, is actually misled the community by telling us they are following OU on Quinoa. They are NOT following the OU at all! I’ve heard this claim before, but where is it in the Chayei Odom? I don’t believe the Chayei Odom or any other posek ever tried to do any such thing, and that rumours about such attempts are based on half-remembered, misunderstood, or misread teshuvos. I’m not so sure. It is mentioned by Achronim, I can certainly remember seeing it. I don’t recall exactly if I saw it in the Chayei Odom itself, I’d need to go back and look. Have you looked? See my other comment about potato flour and R’ Shlomo Zalman. I found the original Chayei Odom (actually Nishmas Odom), and lo dubim velo yaar. He doesn’t asser potatoes, he doesn’t want to asser potatoes, he doesn’t even suggest that it would be a hiddur not to eat potatoes. All he does is report, as an aside, a rumour that in Germany they asser potatoes. It’s not directly relevant to the point he’s making in the teshuvah, so he doesn’t discuss it at all. I know of no evidence that the rumour was even true, but whether it was true or false the CA doesn’t indicate his opinion on the supposed issur. Previous Previous post: What on earth is going on in their heads? Next Next post: Where is a Jew?